I follow the faint traces of a river, stretched across a barren and rocky yet captivating landscape. Winding along the river and skirting around the mountains, I travel by a road that could be one of the most treacherous in the country. By the time I arrive in Bamboret, I have been tossed from one side of my vehicle to the other an infinite number of times. 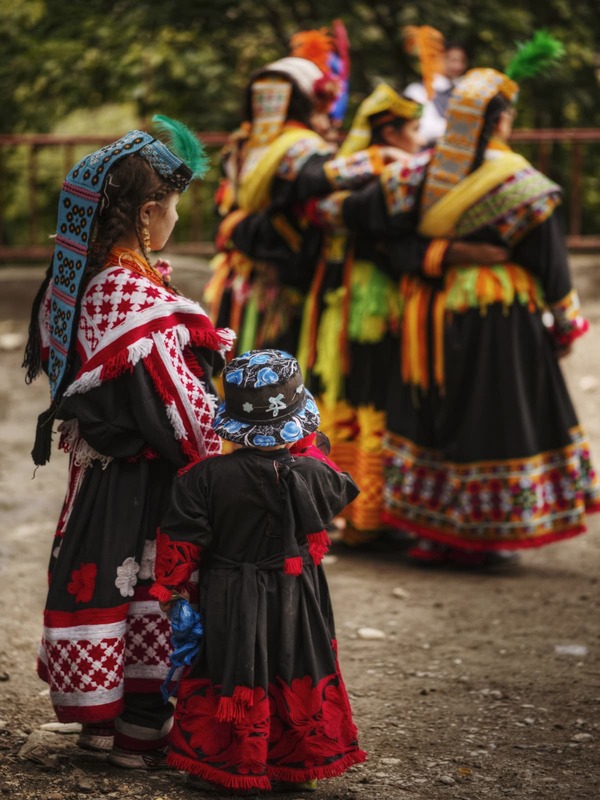 Bamboret is one of three major valleys in Kalash, where the Kalash community has been living for millennia. The legend goes that they are descendants of Greek soldiers who came here as part of Alexander the Great’s Indian campaign in 326 BC — although the validity of this claim is disputed. When I reach a village in the valley, it is already evening and almost pitch-dark except for some lights in a few distant windows sprinkled across the valley. There are no streetlights here. In fact, there are no streets. The houses are scattered and it is difficult for outsiders to move around. Without help from a guide or local resident, one would easily become lost in the maze of hilly paths. Or worse: those not accustomed to the terrain may find it hazardous to walk. The following morning, a continuous thumping of drums echoes across the valley. I follow the sound and approach a small gathering halfway up a mountain. A few children, gathered around a drum player, are singing and dancing. Their elders are watching and guiding them. Clad in colourful costumes and elaborate headdresses, they seem to be part of an extended family. They put their arms around each other and move their legs back and forth with the beat of the drum, singing songs in a local dialect. Moments later another small group joins them, and then another. The crowd gets bigger and bigger. Soon, scores of men and women of all ages are partaking in the singing and dancing. By noon, they move to another venue. 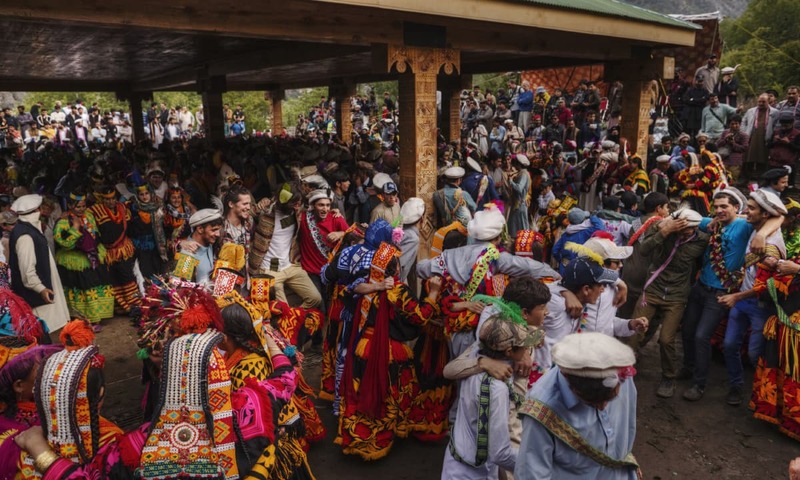 Their seemingly unceasing, repetitive dance and song routines are part of an annual Kalash festival, called Chilam Joshi. It is meant to celebrate the arrival of spring. An even larger crowd, roughly 1,000 people, gathers to watch them, pushing past each other to get the best view. The onlookers are equipped with selfie sticks and cameras, taking an infinite stream of photos and tagging them on their social media accounts. Many visitors then move to the nearby Kalasha Dur Museum, constructed by Greek volunteers (2002-2004) with help from the local community. It is built exactly like a traditional Kalash home, using only traditional materials such as wood, rock and mud. Akram Hussain, its director and chief guide, is a local Kalash. He started working with the Greeks back in 2001, overseeing construction of the building and putting together artefacts. He patiently walks the tourists through thousands of years of Kalash history manifested in various artefacts on display at the museum. 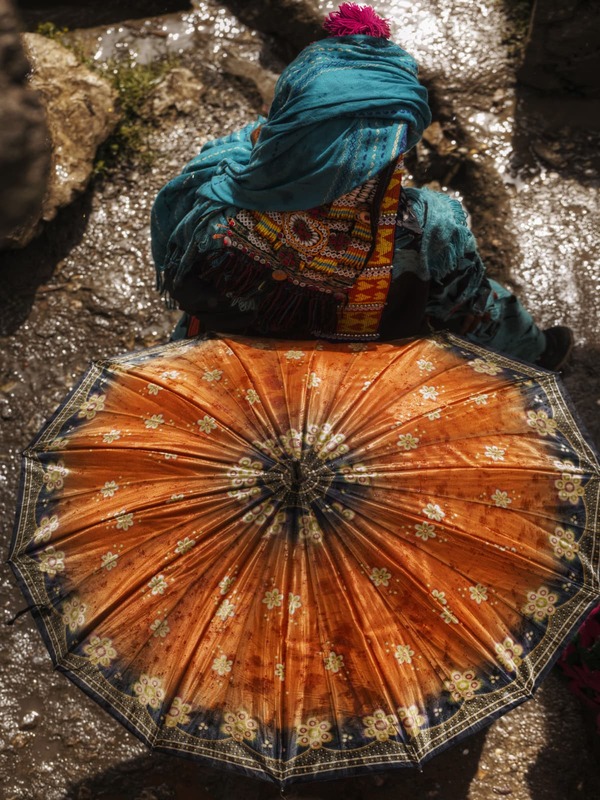 The Kalash have withstood much persecution through the ages. At one point, they feared total annihilation at the hands of other communities, so they abandoned their villages and moved into caves for an unspecified period of time. Weather has been their other big enemy. Winter is unforgiving in the high mountainous valleys of Chitral. The cold is worsened by incessant rain and landslides that force everyone indoors for months. Tough physical conditions are only a part of the problems that local residents face. Healthcare facilities are non-existent and children walk on foot for many kilometres to attend school. They mostly survive on subsistence farming and livestock-rearing, but the two activities suffered a severe jolt due to heavy floods in 2010. The impact of the disaster is still visible in the shape of destroyed irrigation facilities and smashed bridges across streams. Hussian says he has seen his valley change over the years. Roads, admittedly narrow and often dilapidated, have linked the Kalash region with the rest of Chitral and nearby districts of Dir, and then onwards to Peshawar and Islamabad. The availability of motor transport has allowed the Kalash to move to big cities, both for education and work. Their numbers in their own land, therefore, have been dwindling rapidly — from 50,000 or so back in the 1990s to around 4,100 now. Electricity became a problem after the 2015 flood, which washed away the local power plant. A new one has been constructed near Ayun that delivers sufficient power to the villages. There is another in the works as well. And many local residents have mobile phones, connected to the rest of the world just like anywhere else. With these modern amenities have come a lot of outsiders. 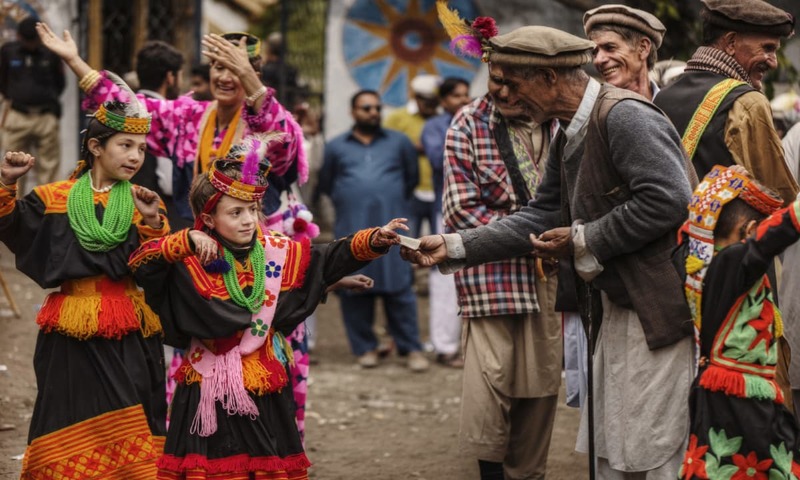 The bulk ascend to the valleys from the plains of Khyber Pakhtunkhwa and Punjab during the three days of the Chilam Joshi festival, moving from one village to another, following festivities around the valley. Visitors often do not have any knowledge or awareness of local customs, traditions and history. 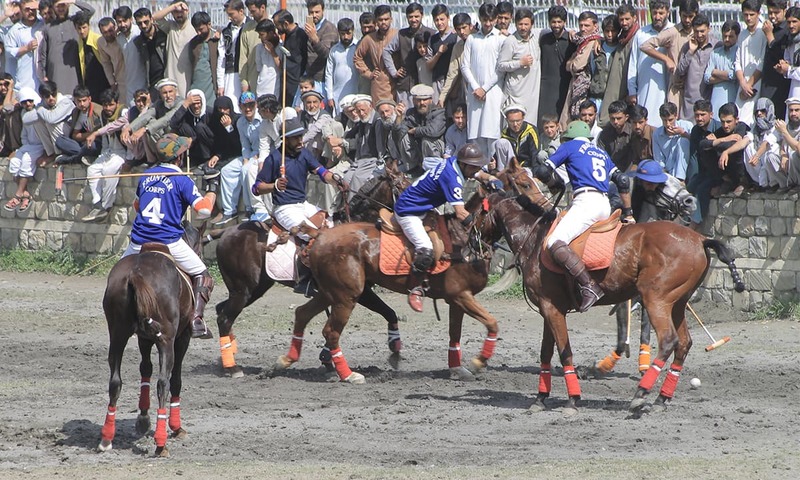 They treat the festival – essentially a centuries-old religious ritual – as a show put together for their entertainment. 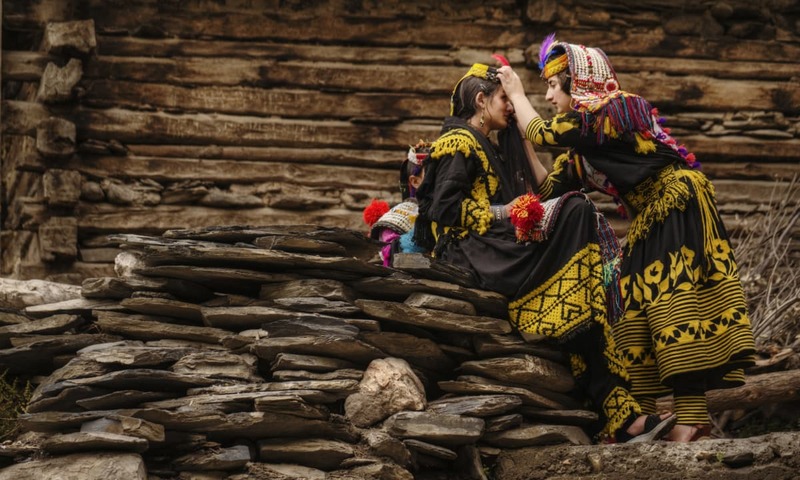 Many of them behave insensitively towards the Kalash people, particularly towards young women who are seen as legitimate targets of ogling and, in worse cases, harassment. 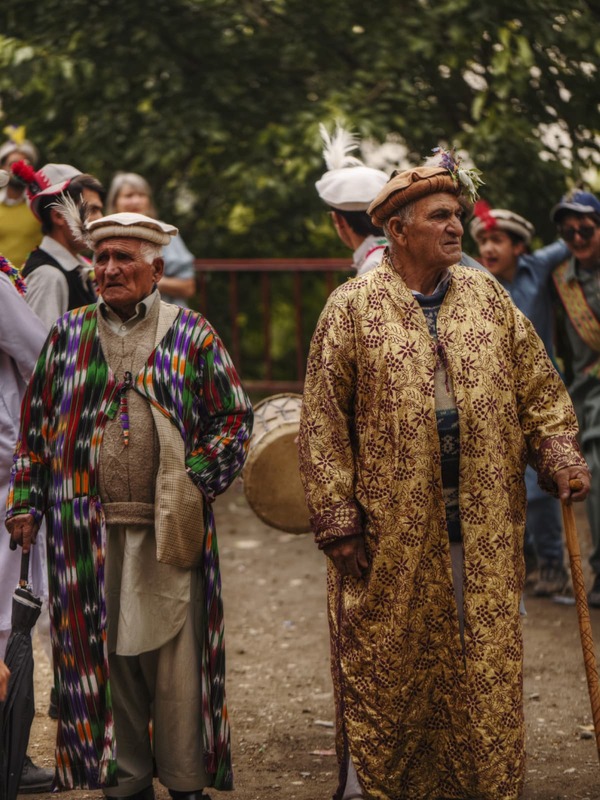 Imran Kabir, a Kalash man who represents his community in Chitral’s elected district council, says outsiders often ask him questions about his religious beliefs. Many want to know why he looks different from them. He handles these queries with charm and wit, not wasting any opportunity to demolish the wrongly held perceptions about his community. Some other outsiders have been even more hostile. Chitral is just across the border from Afghanistan’s province of Nuristan, a stronghold of the Pakistani and Afghan Taliban for years. 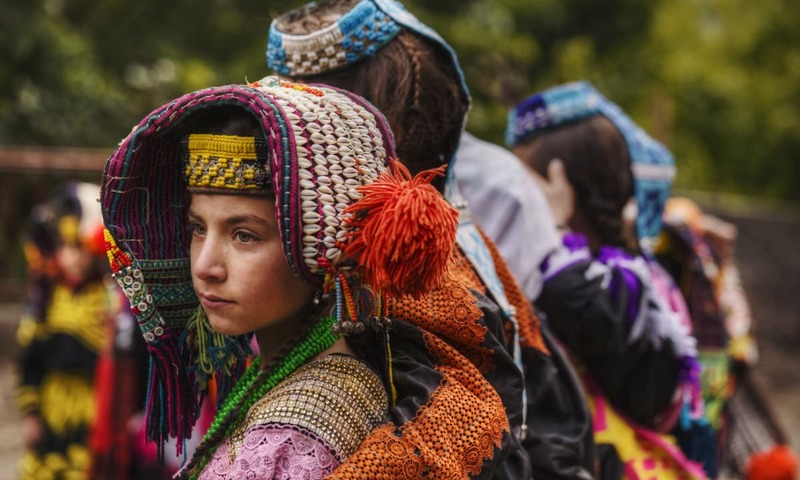 Their influence in the area has forced many Kalash families to either hide their non-Muslim identity or, as in most cases, convert to Islam. In September 2009, a Greek volunteer, Athanassios Lerounis, who had been working on the local museum for the previous 15 years, was kidnapped by a group of masked men associated with the Taliban. 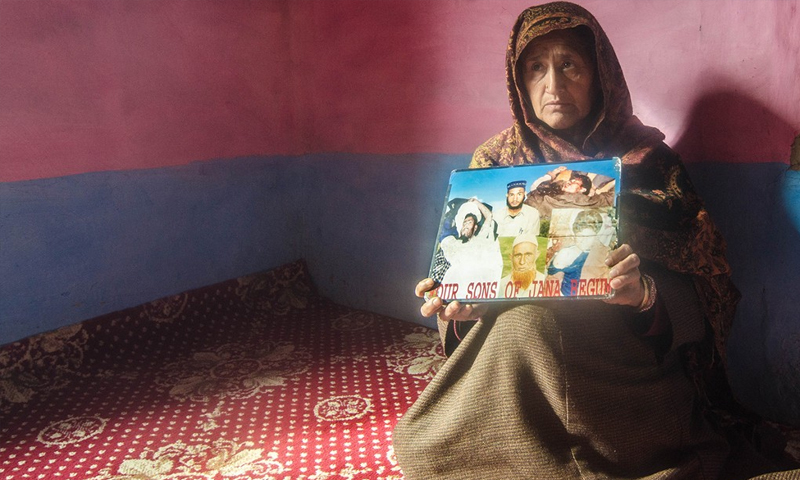 He was reportedly taken to Nuristan where he was kept for months before his release, a result of a deal between his kidnappers and Pakistani authorities. The security situation remains fragile even today. At times, there seems to be more security personnel in a village than local residents. After the festival ends, villagers come together to pick up trash left behind by tourists. Many of them believe tourism can benefit their region but they also point out that it needs to be managed better. Tourists spend a lot of money on boarding, lodging, meals and transport besides requiring local guides and drivers. Their increasing presence in recent years has given a spurt to construction activities in the valleys. 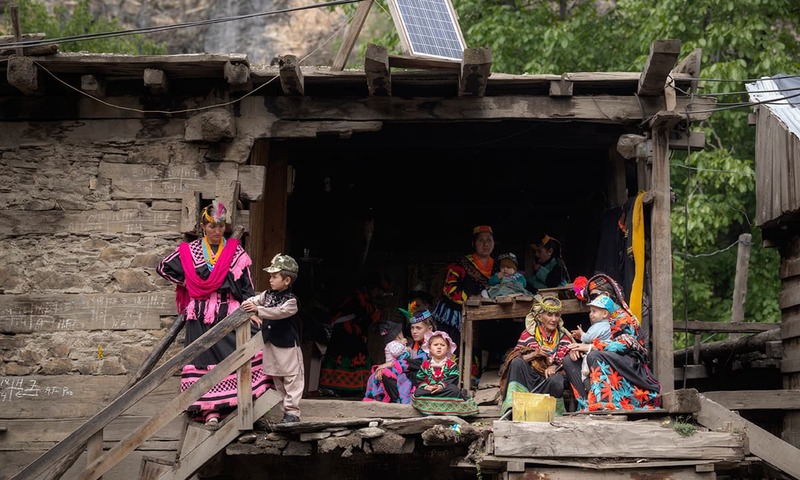 Most of the money thus generated, however, seems to bypass the Kalash community. A lot of it ends up in the pockets of tour companies based in big cities as well as the owners of hotel and inns, who mostly happen to be non-Kalash. The Kalash suffer the burden of the trouble outsiders bring with them, yet reap few of the benefits that come with tourism. The writer is a graduate of Oxford Brookes University where he studied film, photography and architecture. Such a simple and beautiful celebration of life. So uplifting. I noticed a solar panel on top of a house in the first picture. Made me glad. If the Kalaash people are properly promoted to the Europeans and Russians, where the ancestors of these Kalaash people came from, much more likely. Then Pakistan can earn Billions of Dollars in Much needed Tourism cash. The Europeans are very curious people and would love to know something about how their ancestors may have lived in a almost preserved way of life, 2,000 + years ago, before the arrival of Christianity into Europe. If Kalaash lived in any other country, the government of those countries would immediately have realized the value they present, and it means to Europeans. A few Europeans Mountain hikers, do probably come across Kalaash people incidently, just by coincidence, and are surprised and fascinated by them. Our dysfunctional, lazy government and tourism department have absolutely no idea how to promote Pakistan abroad and earn Billions of Dollars of much needed Tourism cash. Built hotels, etc. @Zain Abidin Sorry Pal, they are Iranian descendants not European! The PK province department of tourism must preserve "The Kalash way of life". Thanks Kohi Marri for the article and DAWN group for publishing. Very sad to read the following last lines of the article. "After the festival ends, villagers come together to pick up trash left behind by tourists. Many of them believe tourism can benefit their region but they also point out that it needs to be managed better. The Kalash suffer the burden of the trouble outsiders bring with them, yet reap few of the benefits that come with tourism". I am a Bangladeshi citizen of Hindu faith. My DNA analysis shows that I have 5% Kalash ancestry. Would love to visit this land one day. Beautiful location and beautiful people. Life is so colourful. i really surprised that how much Pakistan is rich in his nature , i love it. @Zain Abidin - the Europeans will definitely be curious about them, at the same time will not be amused by their forced conversions. Your government has some reason not to promote the tourism there.